This is Season Four, Episode Six. This is the next logical step after our last episode. 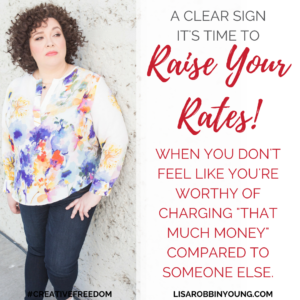 Once you get clear that it’s time to raise your rates, how, exactly do you go about raising them? Have a listen to this week’s episode, where I walk you through a few different approaches, from the basic, Nike approach (just DO it already!) to the “Tuna Can” approach and more. This is the fifth episode in a series about overcoming underearning. Speaking of which, my program Overcoming Underearning for Creative Entrepreneurs is now open. If you need support in owning the value you bring to the marketplace, and adjusting your prices accordingly join us! Students are already reporting positive results! 14:26 – How one coach cut her content in half and doubled her rates, effectively quadrupling her hourly rate. Not a member yet? It’s free! Click here to join our Rising Tide to get email updates, transcripts, and bonus downloadables only available to members. Overcoming Underearning for Creative Entrepreneurs – our program! This one’s all about the dolla billz, baby! Many creative entrepreneurs get emotional when it comes to price increases. So, what if there were an easy, external way to know that it’s time to raise your rates? What if there were 11 ways? Your wish is my command! 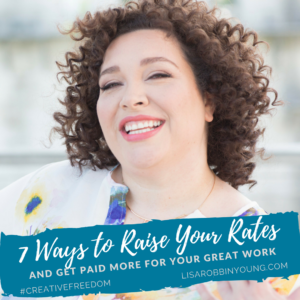 Here are 11 external indicators that can help you determine if the time is right for a price increase in your creative business. Need help communicating that price increase? Consider joining us for the Creative Freedom Guide To Overcoming Underearning, and build your confidence in changing your pricing! 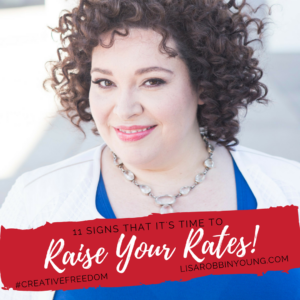 What do you struggle with when it comes to raising your rates? This is Season Four, Episode Five. This one’s all about the dolla billz, baby! Whether you’ve raised your prices in the last year or the last month, it could be time to raise them again if they didn’t go high enough in the first place. Many creative entrepreneurs get emotional when it comes to price increases. So, what if there were an easy, external way to know that it’s time to raise your rates? Your wish is my command! Here are 11 external indicators that can help you determine if a price increase is right for your creative business. Need help communicating that price increase? Consider joining us for the Creative Freedom Guide To Overcoming Underearning, and build your confidence in changing your pricing! 02:21 – Why working for free is problematic, and why you might be inadvertently “programming” people to ask you to work for free. 06:31 – How a client in an economically depressed community managed to raise his rates. 11:00 – When someone is playing “Moneyball” with you, it is time to raise your rates! 16:30 – The “tuna can” tactic that helps you raise rates without changing your current pricing. 19:07 – How to look at barter/trade differently. 22:00 – The power of a $25k offer. Click here to join our Rising Tide to get email updates, transcripts, and bonus downloadables only available to members. 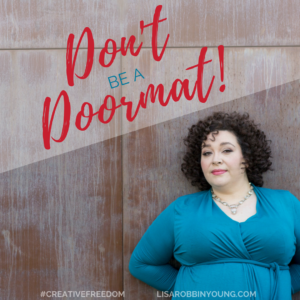 Are you being a doormat in your business? Do you constantly put everyone else’s needs ahead of your own? If so, you’re not alone. This week, we’re focusing on one way to mitigate the 5 core symptoms of underearning: learning how to say “no” with class and authenticity. This is the third in a series of videos this summer about overcoming the cycle of underearning. As a mom and recovering pleaser, I have struggled with this issue personally for YEARS. This week’s episode shares some examples and word choices you can swipe to help you practice saying “no” with class and confidence before the moment strikes. I also share an important warning about the tricky way your “no” can turn into an unwanted “yes” or a straight-up lie if you’re not careful. How do you handle saying “no” and setting healthy boundaries? If you haven’t already accessed this week’s bonus content, you’ll want to do that here. Not a member yet? It’s free! When you register for email updates, you also get access to episode transcripts, worksheets, and other downloadables!